When I was young my older sister used to teach me how we signal our brain to hear what other people say and translate it and then send back a signal from the brain to our mouth so we could talk back, I grew up and I realized that it’s not just for humans but also machines can do the same signal process but by establishing a wireless or internet connection between two points and start a flow of sending and receiving signals that held data between these two ends. A lot of devices can be connected to each other over several networks and these networks are all also connected to each other, and that’s the internet definition. When a message is sent from one device to another, it passes through different roads depending on the traffic holding the address of the other endpoint it should be reaching. In this article, we will be talking specifically about Email Messaging Protocols and its three main types used to manage and set the rules for the communication between two ends and we are going to know what is happening behind the scene when sending and receiving emails. Internet Mail Access Protocol, This is an email protocol used in the receiving process by allowing the user to access a sent email over a remote web server. By using this protocol received emails are stored and saved over the server, they are not downloaded to your device so this allows the user to access the email from anywhere. An example of providers using IMAP is the GMAIL. Post Office Protocol and 3 is for the current version used. This protocol is similar to the previous one (IMAP) in being responsible to manage to retrieve emails, but they are different in storing the received data, so for the POP protocol the email is downloaded on your personal device and then deleted from the server, which limits accessing your email to one device only where your received data are downloaded, but this could save memory over the server. Messaging Application Programming Interface. This messaging protocol works the same way as IMAP but MAPI has additional beneficial features. So the received emails are stored over the server and could be accessed from anywhere. The Key point that distinguishes the MAPI Protocol is the synchronization process. The synchronization process is built in and applied for the email folders, subfolders, Calendar, Tasks, and contacts. Using MAPI protocol, every 25 users need 1 Mega pure internet, so the connection needed is very light and will not be affected by any congestions. How these protocols work together? DNS: Domain Name System, its main role is to resolve the domain name to IP address or vice versa, to make it short, the DNS is responsible to find the address in order to deliver the mail to the correct end. In this emailing process, we have two ends, the sender and the receiver. The sender starts by entering the address of the receiver and send the needed communication, this part is done using the STMP protocol. 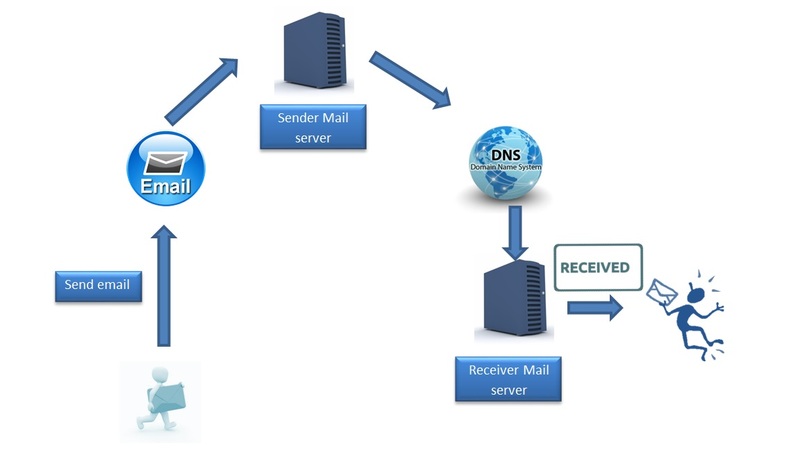 The email then goes to the mail server responsible for the mail transfer until delivery, at that stage the DNS start to resolve the address received in order to find the corresponding mail server of the receiver. Then the email will be sent using this resolved address to the mail server of the receiver by also using STMP protocol for sending the email. As a final stage, the email will be delivered and transferred from the recipient’s mail server to the recipient using POP or IMAP, or MAPI protocol for retrieving the message. This is a simple illustration of how things go behind scenes when pressing the send button on your email box application.